Few will ever know when they have their last Thanksgiving dinner with loved ones, celebrate the birthdays of their kids for a final time or give a life concluding cheer for their favorite football team on a Sunday afternoon. Such is life and why it’s so important to live life to its fullest, one filled with joy, curiosity and a lust – a life of good. I’m guessing when one comes to his last day after having lived a life this way, you can go to rest with a look of satisfaction and contentment, along with a slight smile knowing you made a difference. Kevin Metheny passed away last Friday and his family, friends and the brotherhood and sisterhood of radio are sad. I knew Kevin, candidly not very well. But, always found him to have that lust for life. He was someone that was curious and had a constant need to learn. He knew the radio business better than most and I’m sure could have programmed and managed any radio station in his sleep. Yet there was that need to learn, that curiosity which drove him. He was a thinker and a great radio competitor, both of which I highly respect in any individual. When we found out about his death Friday night (east coast time), I began thinking about why so many of us got into radio. I began to think about how my generation became those old timers who were around 35 or 40 years ago. We became the group we swore we’d never become. Old. Yet Kevin, part of my generation, stayed curious. Most of us got into radio not for wealth, while some did make a good living. Most got into radio because it was fun, it was a creative business and we could learn and satisfy our “curiosity.” We found a group of people that became a close family. And while there may have been disagreements, discourse and at times arguing, at the end of each day we were “radio family” with bonds that could be strained, but rarely if ever broken. Kevin Metheny was everything that made the radio industry good. Even at 60 years old he continued to teach others and learn along with them. His lust for life and a new challenge recently moved him from Detroit to San Francisco to try and breath new life into yet another radio station. Once again there was that curiosity, which he shared with all who had the opportunity to be around him. Kevin leaves us after having made a difference in the many lives he came across. Kevin leaves us having made a difference in the radio business, something few of us will ever have the ability to say. When Kevin departed this world on Friday, somehow I think he felt satisfaction, contentment and had a slight smile on his face knowing all he had accomplished for people and the radio business he loved. Radio may be at a loss today, but Kevin’s legacy will live on. And that’s a very good thing. Kevin was a great guy. Two things about Kevin that he hasn’t gotten credit for. First, although Howard Stern didn’t get it WNNNNNNBC had a sound reason backed by research. With market leader W -A-BC average listeners thought they were listening to ABC. 660 – 770, WABC v. WNBC, etc. 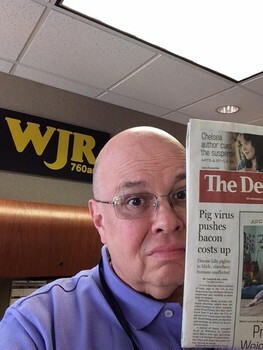 While at WJR Detroit he took a station that was bombo jumble and tuned it to work. PD’s before him thought they need a conservative talk station. He put all focus on local morning and afternoon drive not Rush and company. Neither time-slots talked patrician politics. Mornings Paul W. Smith dreamed as a kid to work at WJR. Warm, highly involved in the community and was/is the broadcast of record for Michigan business. Paul broadcasts live from many of the world’s auto shows. State, City news of all types breaks on his show. If you might recall Cumulus gave him a 7-year contract this year. These guys were there before Kevin but he pulled it together. What Kevin did while airing Rush, etc. he took the station to the middle. Kevin knew not to re engineer these programs. Starting after the elections Congressman Mike Rogers (R) from Michigan, now Chair of the House Intelligence Committee will broadcast from WJR and syndicated by Cumulus/Westwood One. It will be a show mainly focused on national and local security. He’s a former FBI Agent. Rogers was introduced to Lew Dickey by Kevin at Paul W’s wedding. Cumulus owns a number of 50,000 watt AM clear channel stations like WABC, WLS and WBAP all are in the toilet. With Kevin’s guidance WJR is the only successful one in Top 5-8 book after book. Kevin going to SFO was to help create the same. Mike Rogers is a Police State warmonger hater of the patriot, Edward Snowden. That’s taking the station to the “middle” of the Police State, where it already was.